For most people in the United States and Canada, Oxo is a brand that produces kitchen utensils, like kettles for example. For most people living in the UK and Ireland, Oxo is THE traditional beef stock cube for the Sunday roast gravy. Below are the logos of both brands. Now you tell me how unrelated this is. Nevertheless, this review is about the Oxo temperature controlled kettle. 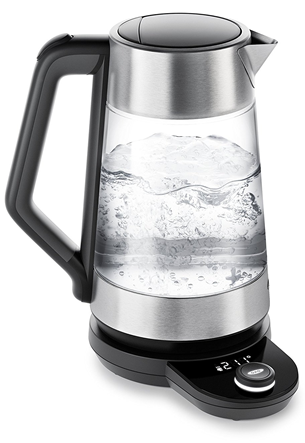 It is another glass kettle in our lineup (see here for Brevo glass kettle review). There is something mesmerizing about watching water – even just boiling it in the kitchen. The temperature setting ranges seamlessly from 170°F/77°C to boiling. Excellent feature but might not be low enough for some white or green teas. 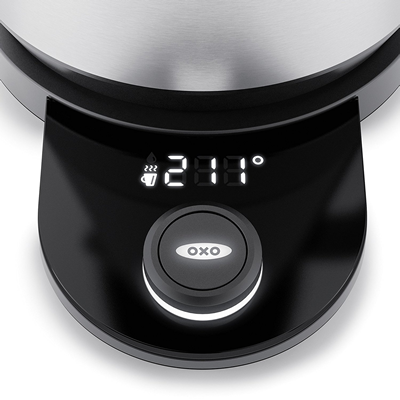 Otherwise, the Oxo kettle is elegant, sturdy and slightly bulky. No problem for smaller amounts of water but quite heavy when filled (nearly 8lbs). 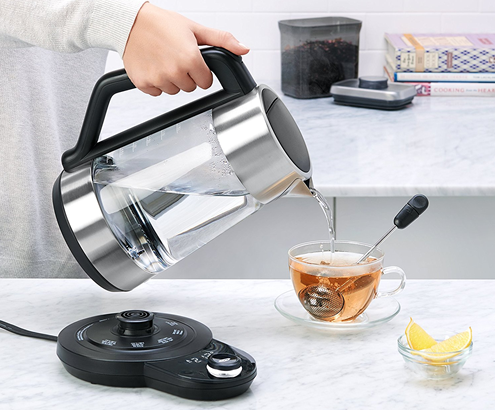 As a buyer of an Oxo kettle, you are treated to a two-year warranty. Unlike other manufacturers, you do not need to register to activate the warranty. All you need is your proof of purchase so keep it safe. To heat the full 1.75l, it takes about 7 minutes. The temperature setting consists of a knob and a digital display in the base. You can select any temperature from 170°F/77°C to 212°F/100°C in 1°F steps. Adjust the dial to the desired temperature and press the ‘Start’ button. The display will show the temperature in real-time. The Keep-Warm function will hold the set temperature for 30 minutes. The lid opens slowly to prevent the sudden release of hot steam. You should not look straight into a boiling kettle anyway. Below is a video with a nice lady in a green dress to watch. Suitable for a $$$ budget. Most kettles will fulfil the first two criteria quite easily, but it is the third one that counts. If you buy this kettle, you might become beautiful yourself just by association. Therefore price should not matter.